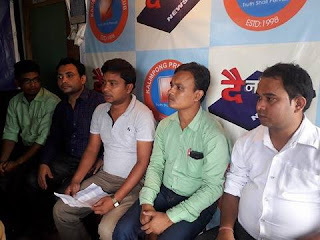 The Jalpaiguri Duars Biswakarama Samaj today submitted a memorandum to JAP President Dr Harka Bahadur Chhetri demanding representation in upcoming Biswakarma( Kami) developement board. Dhiraj Rasaily chief advisor of the Samaj and his team submitted the memo to Dr Chhetri at JAP Party office . Rasaily informed that the Jalpaiguri Duars Biswakarama Samaj is the only organisation from Duars region which has branches in all seven blocks ie Kumargram, Kalchini , Madarihat,Dhupguri, Nagarkatta, Mateli and Mal. He said we have a 50 thousand plus population in Duars area. According to which on population basis we want representation in the board. The Samaj have given names of 7 persons which should be included in the Executive body of the upcoming board in the memorandum . Rasaily expressed the gratitude to CM Mamata Banerjee and the work done by Chhetri to help the formation of development board. Meanwhile Bimal Diyali President of Biswakarma Youth AssocaItion when asked about the demand said that the board is for the welfare of Biswakarma People of this region. There is no doubt that the board will have representation from Duars too along with Hills. 0 Respones to "Dooars representation call on Kami Board"